Ingredients: aqua (water), glycerin, gluconolactone, peg-40 hydrogenated castor oil, sodium pca, sodium benzoate, sodium lactate, cetrimonium bromide, disodium edta, marrubium vulgare (horehound) extract, arginine, aspartic acid, parfum (fragrance), pca, sodium hydroxide, glycine, alanine, serine, valine, calcium gluconate, isoleucine, proline, threonine, limonene, linalool, histidine, phenylalanine, citric acid. 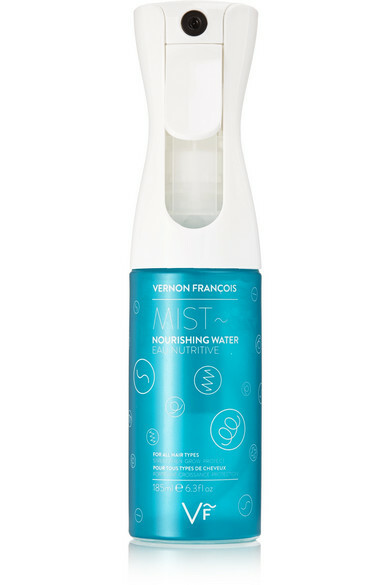 Developed by award-winning hair stylist Vernon François, this hydrating 'Water Mist' is infused with a nourishing blend of amino acids to repair and strengthen your hair. A few spritzes before styling will not only make your locks easier to tame, but infuse them with a subtle aroma of grapefruit and ginseng, too.